Inverie is the largest settlement in mainland Britain not connected to the road network, and you are unlikely to end here by accident. Unless you own a helicopter there are only two ways in or out: a very long and very rough walk, or by boat. Most people choose the boat. These days you have a choice of boats. 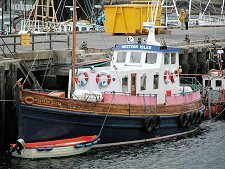 The vessel shown on this page is the Western Isles, which is run by Western Isles Cruises. For further information, fares and timetables see their website. 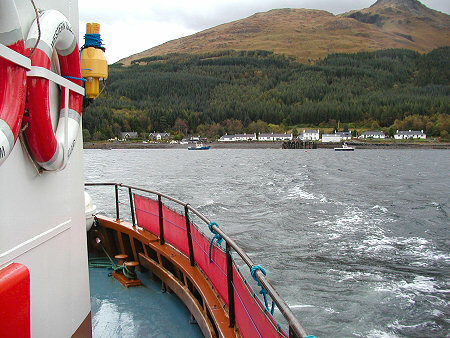 Because the boats form the only regular link with Inverie, you find yourself sharing your trip with a cross-section of Scottish reality you'd never find on a service primarily used by visitors. This means you are likely to be sharing the journey with shopping and supplies for 60 people. In many ways the trip across is an extension of the life of the village itself. Inverie lies on the north side of Loch Nevis. 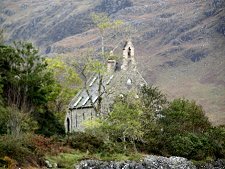 Your first sight of it is as a tiny line of whitewashed buildings strung out along the shore of Inverie Bay; almost insignificant under the towering bulk of Sgurr Coire Choinnichean. At 769m this is not a high mountain by Knoydart standards, but as backdrops go it is still pretty impressive. 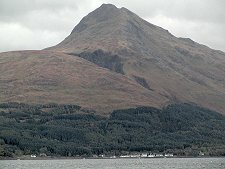 To really appreciate Inverie, you need to understand a little of its recent local history. 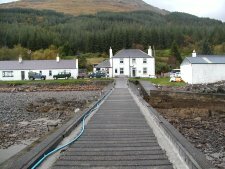 Knoydart has been done few favours by its owners over the years, all the way back to the 19th Century clearances that came close to completely emptying the area. In more recent years there has been a succession of usually absentee landlords who were more or less interested in the real well-being of the area and its community. And in the late 1990s there was a danger that the whole peninsula might be turned into a military training area. But that wasn't what happened. 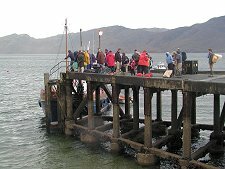 Instead a number of agencies got together with the community, and in 1997 the Knoydart Foundation was set up. This gives the community a real stake in the ownership of the area and in its own future. For somewhere so small, Inverie has a lot to offer the visitor. And no visit is complete without calling in at the Old Forge. This is recognised by the Guinness Book of Records as the most remote pub in mainland Britain; but that doesn't stop it providing an excellent welcome and a range of drink, food and, often, music. 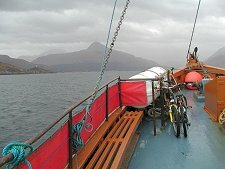 Inverie also offers a choice of accommodation and a shop.